A couple of weeks ago I mentioned that I had some irrigation problems where it looked like the under the canopy irrigation didn't run or only partially ran for at least four days. However, since then, I wasn't getting the growth on the pumpkins that I was expecting. Today I think I figure out what has been going on this season. The under the canopy watering runs off of well water. My good neighbor, whose property I grow on, allows me to use his well for watering, which is great. However, I discovered this morning, is that the pump seems to be having issues and at times the water pressure is very low and as a result the plants may have been getting only 1/2 to 1/3 of the water that they should have been getting. I'm guessing that when I go out in the mornings there is enough water down that the ground looks wet but not the optima amount of water. I've been monitoring the soil moisture for the last few weeks and have been adding additional water at times. But today was the first morning that I went to add additional water and the water pressure was obviously low. So low that when I went to water the kids plants there wasn't enough pressure to get any spray. As a result the plants have been partially dehydrated for weeks. Not enough that there has been obvious flagging, but enough that it has effected growth. I haven't had this issue with the well in the past. Kind of discouraging to lose a season because of it, but at least I know what is going on now. How long do you water for? I have too different irrigation systems for the patch. One is under the leaf canopy and the main water source for the patch. It runs off of well water. With it, I'm watering between 6-9 minutes a day depending on what the temperatures are like. I typically turn it on around 10:30 and run it until about 5:30. The second is really a misting system that turns on about every 15 minutes. Overall it puts down very little water. It mostly is just for cooling off the leaves during the heat of the day. I enjoy your blog! 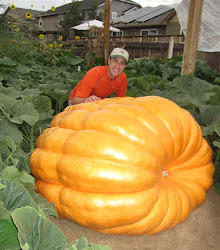 This is my first year growing giant pumpkins. I have 1 plant. It is over 6' round. The top of the plant are wilting. I am wondering if it is because the pumpkin is sucking the plant dry? Hi Brad. During the heat of the day the plants will wilt in the sun. Mist the plant a little and typically it perks right up. If it wilts a lot, start giving it more water. Some plants tend to wilt more than others. My 282 Scherber plant always, even with regular misting wilts when it is sunny and hot. The 1985 Miller plant however, usually wilts very little and they both get the exact same amount of water and misting.